I am quite ashamed to admit how long I have had this book for. I just checked back my messages and discovered that Publicist Director Patsy Irwin sent me it last November! At the time, I commented how big it was and she agreed but said it was unputdownable. I have to admit the sheer size of it has been one of the reasons it has been languishing on my bookshelf so long but I was determined to read it over summer so included it in my #20BooksofSummer list. And Patsy was absolutely right – I couldn’t put it down. On the face of it, it’s a simple enough story. It follows Cyril Avery – not a real Avery of course – from his inauspicious start being born to a young unmarried mother cast out of her small rural community in Ireland, through his unorthodox life with his adoptive parents, his schooldays and friendship with Julian, sees him living in Amsterdam, New York and finally back in Ireland. And yet, Cyril’s story is completely gripping. Cyril is an immediately likeable character. We first properly meet him as a precocious seven year old living with the rather strange Charles and Maude Avery who make no secret of his being adopted. I did rather wonder why they bothered adopting him as they didn’t treat him like a son and took every opportunity to remind him he wasn’t a real Avery. They way they spoke to him was often wholly inappropriate as though they had forgotten he was just a young boy. Their conversations with him were, however, often very funny, and that humour was evident throughout the book with Cyril in particular having a very self-deprecating sense of humour. The author explores the political and social history of Ireland in the book, along with attitudes to women, relationships and homosexuality, often exposing the hypocrisy and influence of the Catholic Church. Having taken so long to get around to reading the book, it seemed appropriate that I was reading during the week where there were so many commemorations of the 50th anniversary of the decriminalisation of homosexuality in Britain at least. Several of the characters were gay in a time and place where it was absolutely not tolerated. I have heard so many sad stories in the media this week of men – and women – who had to hide who they were and the appallingly intolerant treatment they experienced. The prejudice, ignorance and fear surrounding the AIDS crisis in the 1980s was brought vividly to life during Cyril’s time in New York. John Boyne’s writing is superb as he moves through the different periods of Cyril’s life with ease. He conveys Cyril’s thoughts and emotions perfectly and even when periods of time aren’t covered, the reader is left in no doubt what has happened in the intervening time and the impact this has had on Cyril’s life. Cyril’s friendships, acquaintances, experiences and loves are all expertly combined to create a sweeping epic novel of an ordinary, yet also extraordinary life. If you have the book on your to-be-read list but are hesitating because it’s so big, hesitate no more. It is an outstanding novel which won’t feel like any kind of effort to read. I could happily have read more about Cyril Avery and was genuinely bereft to have to leave him behind. I have had the pleasure of reading many amazing books this year already but The Heart’s Invisible Furies is, without doubt, my top read of 2017. Indeed, I’d say it’s now one of my favourite books ever. Huge thanks to Patsy Irwin for sending me a copy of this book. The Heart’s Invisible Furies was published by Doubleday in hardback and as an e-book on 9th February 2017. The paperback will follow in late December this year. You can buy in all good bookshops or order a copy online here. Fantastic review Joanne. Out there as a book I know I must read!! Thank you – I rather liked the book! Glad you loved it, Joanne. You know how much I did too. I think he’s a fabulous writer. I have only read a couple before but will be checking out his back catalogue. 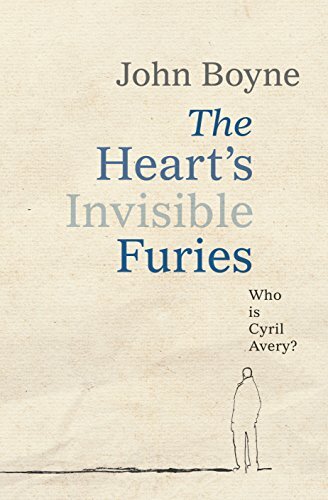 Check out the book, The Heart’s Invisible Furies, by John Boyne, as reviewed on the Portobello Book Blog.